The Late Raleigh Rutherford Haynes Was One of the Great Men of His Day in Old North State—Founded the Famous Cliffside Gingham Mills Worth Over a Million Dollars—Cities Stand Now as a Lasting Monument to His Enterprises And His Devotion to the Building of Community. Rutherford County, born amid the carnage of 1779 and terrorized by Cherokee Indians, guerilla warfare, and murderous onslaughts upon peaceful settlers, is one of the richest, picturesquely prettiest, most progressive of the Piedmont section of North Carolina, with a population 100 per cent pure American, descended from the early Scotch-Irish settlers. A family which played a grand part in the carving out of this great commonwealth, the sweeping back of the savages and feeling of the forests and development of the land was the Haynes family, which for generation after generation has held leadership in the affairs of this section of Dixie. The scions of the house of Haynes have been planters, merchants, professional men and interested in commercial pursuits. Of this line was born on June 30, 1851, Raleigh Rutherford Haynes, who proved that he was born true to the traditions of the family and shines forth as one of their most illustrious and useful members. Mr. Haynes has left a monumental lifework, which is being projected further by his sons, Charles H. Haynes, Grover C. Haynes and Walter H. Haynes and Z. O. Jenkins, who has been with the business for 20 years. To the late Raleigh Rutherford Haynes, deceased Feb. 6, 1917, stand the cities of Cliffside and Avondale, then just started and named after his Florida home, as memorials–model industrial communities. Mr. Haynes entered upon the founding of Cliffside in the year 1900. He bought a vast expanse of wastelands on the Second Broad River and planned the transformation of this virgin jungle of vines, weeds and sandy swamp into highly useful and valuable property. He built the Cliffside cotton mill, which is now something of the most impressive in all Dixie under one roof in the country. The Cliffside mills now operate 41,210 spindles and over 1524 looms, employing over 900 skilled textile operatives under the most efficient sanitary working conditions and at high wages. The Cliffside mill is of four stories, brick construction, with 11 cotton warehouses and a surrounding setting of 7 stores, and supply warehouse, the famous Lakeview dairy, a modern woodworking plant, an up-to-date steam laundry, a flour and feed mill, the Haynes Bank, an ice plant, a cotton ginnery, a hotel, Baptist, Methodist and Presbyterian churches, efficient schools, the Cliffside Motor Co., a first-class deep-well water system, sewerage, community buildings and a welfare system not surpassed by any industrial corporation in perfectness of detail for the health, comfort, happiness and general good of the workers. The community also boasts the Haynes Band, noted all over North Carolina for the quality of its musical entertainment. At Christmas season there is a community tree and each Haynes employee receives a substantial Christmas gift. Cliffside has just reason to be proud of its magnificent school building, its Haynes memorial building and its churches and community buildings. These have cost a fortune to build and are faultless specimens of modern architectural beauty. The Haynes memorial building affords a spacious auditorium, a large reading room and library, a banquet hall, gymnasium, baths, kitchen, guest rooms, cafe, lodge rooms, amusement quarters, etc., equipped without regard for cost. The Cliffside mills have a capacity of close to 76,000 yards per day and it is one of the largest gingham mills in the country. The Haynes workers are housed in clean, sanitary, modern neat bungalows, with electric lights, sanitary regulations and precautions, ample gardens, and served by their own dairy. Charles H. Haynes is president of the Cliffside Mills and is a Baptist, a Mason and a Shriner and holds membership in the Rutherford County Club. He is a man of progressive, broad gauge policies, interested in the development of the entire community, who is never found missing when the roll is called in any worthy, intelligent effort at the lasting upbuilding and expansion of the county. He is considered an authority on textile manufacturing matters and is thoroughly grounded on all technical progress therein. The name of Haynes in ginghams and textiles is an insurance policy of quality and a sterling trade mark of quality as magnificent as that of Tiffany on silver plate or Homer Laughlin on china. Mr. Charles H. Haynes is a man who has no hobby unless it is business and systemization, and he daily dispatches a world of routine matters in a faultless way. 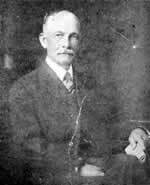 W. H. Haynes is dynamically interested in the welfare of the workers, in the extension of the Haynes industrial projects, the upbuilding of the district and all effort at civic progress, He is vice president of the company and is a Baptist and a member of the Rutherford County Club. Mr. Haynes is public spirited, progressive and far visioned and is a red-blooded booster for a richer county. Z. O. Jenkins is secretary-treasurer of the Cliffside Mills and is a gentleman of winning personality, educated and broadened by experience and travel, who is patriotic to the development of Rutherford county industrially, commercially and financially. He is a Baptist, a K. of P. and a member of the Rutherford County Club and has written the story for this edition of the Industrial History of the county, on which [he is] closely versed and has made an intensive study. Grover C. Haynes studied for the dental profession and graduated from Atlanta Dental College. He had practiced but a few months when his good father was called by [……] he gave up the profession and entered the office as treasurer until his health failed so seriously as to compel his giving up the confining duties of treasurer. He is now the business director and engineer of the company and is one of the units of the smooth running corporation machine. A Baptist, a Mason, a Shriner, a member of the County Club, he owns the largest and finest-kept farm in this county, its specialty being blooded livestock and Berkshire hogs in particular.He is setting an agricultural and livestock example to the whole county. The Lakeview Dairy is a model sanitary one and a high test herd of registered Holstein cows. These are tested several times annually and are as fine stock as can be had. If there is one thing above another in which Cliffside takes just pride, it is the schools, the teachers and the [….]. No schools in the South rank higher in efficiency. Clyde A. Erwin is principal and is surrounded by a corps of most capable teachers. The Avondale schools have five teachers; under Frank Hall. In reality I could have spent a whole week noting systematic details which have taken years to think out and in the finesse of Cliffside’s planning. I am told that it is a dogless and catless town , and these pets of some and night nuisances to other are barred from this city of peace and health. Mr. Haynes planned long and wisely. He instilled in his new work the foundation of clean morals and Christian principles, which are rigidly adhered to now as then. Recently a Massachusetts Yankee touring this way visited Cliffside and he said to the writer "I was amazed at the well kept, wonderful grounds, magnificent and beautiful buildings both within and without, as well as the highly perfected system of looking after the welfare and comfort of employees and their families. It was a revelation to me and surpassed anything of the kind I have ever seen in either North or South." Cliffside is today a model, sanitary city, with all modern improvements and conveniences and a population of around 3,000 people. Full recreative facilities for outdoors are afforded employees. In fact it seems that the mill management has overlooked no item nor spared any expense to make the workers happy, healthy and contented. A practical thrift plan is in full operation, and employees who desire to save their money are paid full six per cent interest for loaning it as they have to the company. All of this is the working out of the plans of the late Raleigh Rutherford Haynes.